Everyone knows that washing your hands is the most effective way to prevent the spread of infections within healthcare settings. So then why is hand hygiene compliance still such an issue? That seems like a lot of handwashing. And when you take into account the number of patients a healthcare worker in a high acuity unit interacts with during a 12-hour shift, that number can quickly climb. Not to mention the time constraints if a healthcare worker were to ‘effectively’ wash their hands with soap and water only in a manner consistent with handwashing protocols. 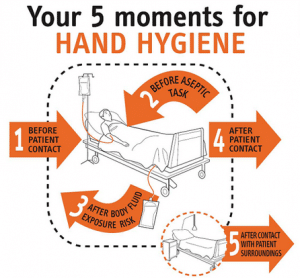 With that laundry list of reasons for poor hand hygiene, it doesn’t seem that surprising why hand hygiene might still be an issue! While the standards and opportunities for hand hygiene remain the same in healthcare, the availability of more efficient product and technologies have made it an easier task for staff to comply with. Proper hand hygiene and sustained compliance are a necessary thing when working in healthcare to ensure the health and safety of the staff and patients. It is well known that hand hygiene makes an enormous impact on patient safety and the performance of the hospital, so making sure that staff are aware of, and able to follow, the 5-Moments is the first step in finding success with overcoming poor hand hygiene practices.